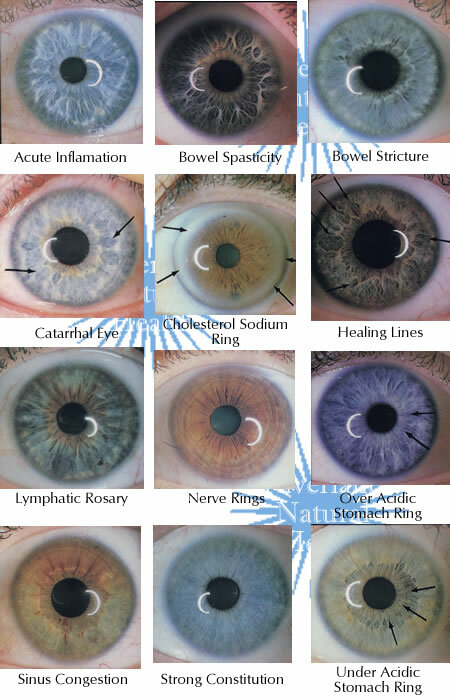 Iridology is based on the scientific study of the iris — the colored part of the eye. 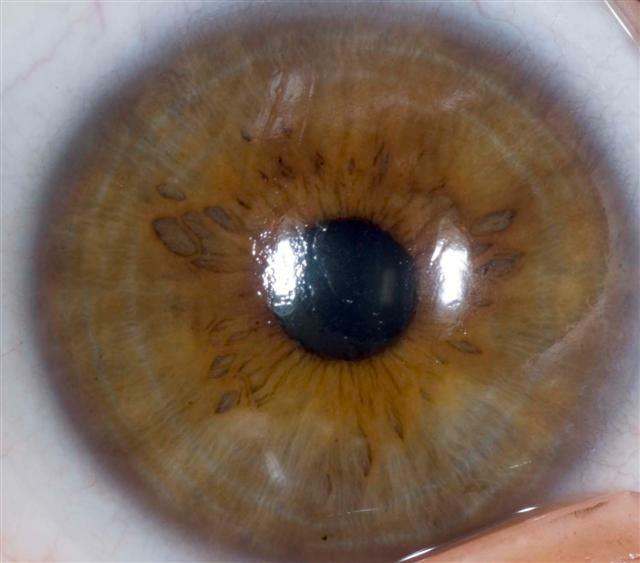 Like markings on a map, the iris reveals physiological conditions, psychological health risks, challenges and/or strengths of various organs and personality traits. 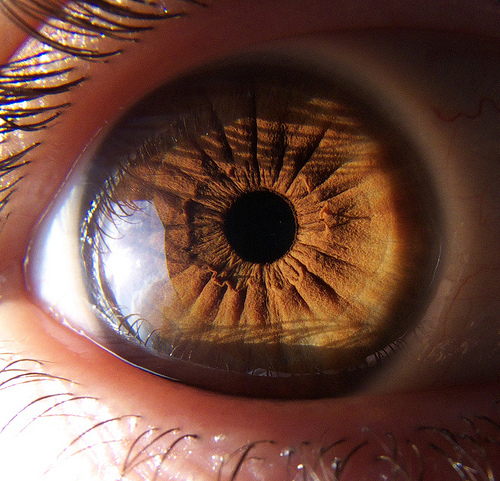 Through iridology we can get an understanding of your past, present, and potential future health conditions by assessing the various body systems. Your inherited tendencies compounded by toxic accumulations in various parts of your body are also revealed. The Science of Iridology is based on the analogy of one of the most complicated tissue structures of the whole body – the iris. It is a method whereby the doctor or health practitioner can tell, from markings or signs in the iris, the reflex condition of various organs and systems of the body. These markings represent a detailed picture of the integrity of the body; it’s constitutional potentials, areas of congestion or toxic accumulations and inherent challenges and gifts. Nature has provided us with an invaluable insight into the vital status of the health of the body by transmitting this information to the eye. The laboratory testing procedures practiced today, which are not always necessary, are expensive, time-consuming and, often, uncomfortable to the patient. 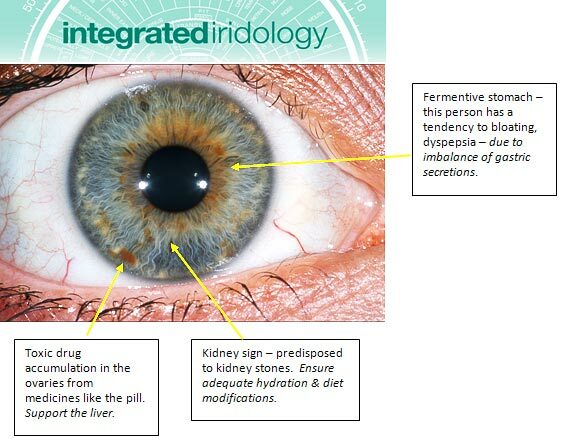 With iridology, we have a simple, painless, economical and non-invasive way of looking into the body. This is not to say that it should exclude other forms of analysis. On the contrary, it may be employed in conjunction with any other system of analysis or a diagnosis that a practitioner wishes to use. Now, more than any other time in history, we are in a need of accurate and less complex means of analyzing a patient’s condition. Eighty percent of the diseases treated in this country are of a chronic nature. The tissue found in chronically afflicted patients can be monitored better in the iris of the eye than, possibly, by any other method of analysis. Iridology gives an essential insight to the development of these chronic diseases or the diminishing of that disease or inflammation. The Science of Iridology is based on the analysis of one of the most complicated tissue structures of the whole body-the iris. 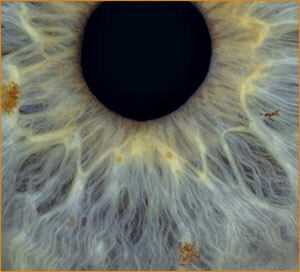 Iridology offers a unique perspective to the concept and practice of preventive health care. It involves a non-invasive diagnostic procedure, commonly used by the European practitioners and may be useful in the detection of existing conditions as well as inherited genetic weaknesses. It is known that approximately 300 thousand nerves from various parts of the body make their way to the optic nerve. Therefore, projection of systemic activity may be visible at the iris. This sign is a result of a chemical imbalance in the body, pertaining to non-organic sodium excess, calcium out of solution, as well as high cholesterol and high triglycerides in the blood. Cholesterol Ring is also a non-specific liver marking. It may transpire when hepatopathies (liver disease), diabetes mellitus or hypo-activity of the thyroid are present. When there is a problem with the inorganic sodium and excessive fats in the body, there may be hardening of the arteries, calcium spurs and deposits, joint problems and so on. This does not necessarily mean that the blood levels of cholesterol are high but indicates there is an imbalance of fat metabolism. 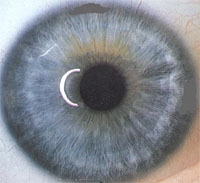 The cholesterol ring is a white, opaque ring that appears around the outer edge of the iris either partially or wholly. 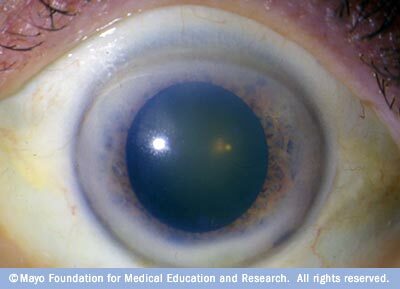 This condition is represented by a hazy bluish ring surrounding the outer perimeter of the iris. This indicates a lack of oxygen in the body. Lack of exercise and iron anaemia are common causes. Venus Congestion (Varicose Veins, Haemorrhoids Vein Obstruction) This is a term used by the Iridologist to indicate a lack of circulation to the arms and legs. The legs and feet are the farthest away from the heart. Thus the blood must be returned from the legs against the force of gravity. This is why circulatory problems usually manifest first in the feet and legs. Vitamins helpful are A, B, B1, C, D, G and Niacin. Minerals include Magnesium, Phosphorus, Silicon, Fluorine, Iodine, Iron, Manganese and Sulfur. Herbs include Capsicum, Butchers Broom and Hawthorn Berries. Cold water leg baths and grass and sand walking as taught by Fr. Sebastian Kneipp are very helpful as is exercise in general. Capsicum can also be rubbed on the hands and legs to be absorbed through the skin and a bath can be taken as well with Capsicum. 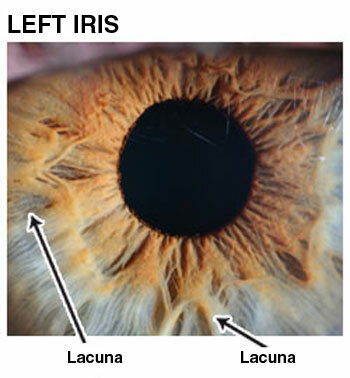 They are the small reddish-brown discolorations in the iris that may be inherited or acquired. These discolorations are referred to as inorganic chemical substances that are deposited in weaker tissues of the body. The areas concerned have less vitality to throw off drug accumulations. These may be relatively harmless but may also irritate the tissues, creating more chronic problems. These discolorations will lighten up in time with continued cleansing procedures. As indicated, specific areas that have weakened nerve supply as seen in the autonomic nerve wreath. A poorly defined wreath represents a weakened autonomic nervous system and intestinal insufficiency. This shows as a lack of circulation in the cerebral/brain area. When there is a lack of circulation there is also a lack of oxygen, as well as specific chemical elements. Gravity does not help matters at all but it is recommended, if possible, that slant board exercises would benefit this area greatly. Leg “pump” exercises also benefit cerebral anaemia. Build up the blood with iron-rich foods such as green vegetables, beets, black cherries, black raspberries, liquid chlorophyll and other supplements. Moving to a higher altitude can help. To improve circulation Dr. Jensen recommends slanting board exercises, early morning barefoot walks in dewy grass or on a sandy beach, Kneipp baths, alternate hot and cold foot baths and physical exercises appropriate to the persons age. Physical exercise stimulates increased adrenaline secretion which in turn stimulates faster, deeper respirations, faster heart action and greater oxygenation of body tissues. Cerebral Anaemia means there is a lack of adequate blood supply to the brain areas for one reason or another. Dietary modifications, exercise, herbs, vitamins, minerals, food supplements and use of a slanting board on a regular basis are very helpful in these cases. Herbs such as Gotu Kola, Capsicum and Ginseng are also very helpful. The vitamin necessary is Niacin. The skin is a very important part of our elimination system, throwing off an average of two pounds of waste per day! It seems that if the kidneys are not functioning properly, it may cause an excess of wastes being eliminated through the skin. This is also true in the reverse. 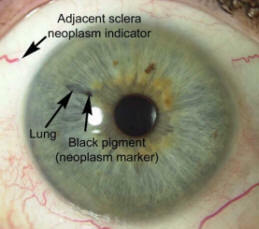 White round flecks known as tophi may be found opposite a dark skin area indicating elimination processes are restricted by poor action of the skin and to compensate there will be catarrhal formation. To keep the skin more active, it is best to find clothing that is not tight fitting. Skin brushing with a vegetable bristle will loosen away dead skin improving elimination. The lymph glands have eight functions. Herbs such as Garlic, Onion, Pau d’Arco, Golden Seal, Echinacea and other foods containing organic sulfur are beneficial to the Immune/Lymphatic System. Vitamin C is also important to this system. The best way to keep the Immune/Lymphatic System clean is to not suppress any discharge out of the body or any fever the body may develop. A Fever is the body’s Immune System burning out toxins. By using medication to lower a fever we suppress the Immune System. Chlorinated drinking water and chlorinated swimming pools should be avoided as chlorine can also suppress the immune system. This sign resembles the spokes on a bicycle wheel. They appear as dark brown/black grooves in the iris and are seen radially from the frill outwards with the base wider than the tip. They represent inherent weakness in the bowel area and are indicative of a toxic, slow moving bowel. This is most commonly found in the biliary iris as a constitutional sign. When these are found to be pronounced in the iris, special attention may be needed to take care of the bowel. Radii Solaris are also usually associated with sinus problems, toxic headache and other toxic symptoms. Radii solaris indicate nerve weakness and are a sign of insufficiency to the organ, gland and tissue field areas into which they disperse in the iris. If seen in the adrenal gland the subject is likely to tire easily. If seen to be piercing the heart or kidney zones, a circulatory problem could result. This may be caused from a variety of conditions such as diet, state of mind or under-functioning of one or more elimination systems. Often all of these associations may be involved to some extent. Assimilation is how well you absorb the food you eat. It is not what you eat that counts, it’s what you assimilate that your body can use that makes the difference. We absorb mainly in the small intestine, through the small villi which compose the intestinal walls. The absorptive function of these villi may be hampered by certain diets. Some persons may also have an inherent weakness in this area which does not allow them to utilize their foods as well as others. A proper diet is the best way to aid in assimilation. Also adequate rest is needed as a fatigued system cannot absorb well. Herbs such as Alfalfa, Peppermint, Papaya and Ginger are also beneficial. Should the villi become unable to absorb nutrients properly, cleansing may be encouraged using the herb Comfrey and the digestive aid Pepsin as well as a bulk former such as Psyllium Hulls along with Cascara Sagrada. Medically these are called “Diverticula”. We refer to them as “Pockets” because it more accurately depicts what they are, an outpouching of the colon wall associated with an inherent weakness in the colon and perhaps also with increased colon gas developed by improper dietary habits (improper food combining). Bowel pockets can usually cause no problems if kept clean. Bowel pockets frequently can be the spawning-ground for localized sub-clinical infections. When colon debris are allowed to accumulate in them and putrefy, these pockets can become infected and inflamed. If this occurs it is called “Diverticulitis”. This is a serious condition. Even when not acutely infected, there is frequently a “low-grade” infection present producing an irritation of the nerves in the colon wall. It is not uncommon for bowel pockets to be responsible for more enervation and conditions of ill-health than is generally recognised. Slippery elm, (Psyllium is contraindicated) and adequate intake of Acidophilus bacteria. Chlorophyll containing products also can be a great help with this. Avoiding granola, individual nuts unless ground into a butter and flax seed. This is very important as these foods can become trapped in the pockets and can cause pain. Adequate intake of pure water is vital to proper colon health. Many conditions in the body are associated with the neglect of these bowel pockets. 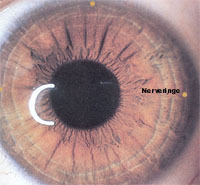 Nerve rings are depressions in the iris stroma and also are referred to as neurovascular cramp rings, cramp rings, contraction rings or nerve rings. These may be inherited or acquired but either shows that the individual has some degree of nerve tension or anxiety. They can also indicate mineral deficiencies, especially calcium. In today’s lifestyle, it is not uncommon to find that the majority of people have some degree of tension reflected from their jobs, relationships, finances, etc. Nerve rings can vary from light to heavy, depending upon the degree of nervous tension in the individual. When we see a nerve ring pass through the thyroid gland (the emotional gland), this represents extreme emotions that can be portrayed in the individual. Stress rings are commonly seen in the anxiety tetanic constitutions. If your nerve rings are heavy, perhaps you ought to be giving some thought to an alteration of your lifestyle or taking up some relaxation techniques. Some persons simply drive themselves too hard. They need to spend some time pursuing a relaxing hobby, mentally, if not physically, removing themselves from their usual work. Vacations are especially necessary and are greatly beneficial in reducing stresses of everyday living. Herbs are highly beneficial also and the ones with the most benefit to the nervous system are Catnip, Valerian, Chamomile, Skullcap and Wood Betony. All of the B Vitamins are also beneficial. When the nervous system becomes irritated it shows up in the iris of the eye as bright white or covered with pigmentation. Irritation of the nervous system can occur due to injury or stress. Vitamins, minerals, and herbs for the nervous system are beneficial for irritation. These are the iris signs that represent acquired or inherited weaknesses in the body. They can be recognised by their shapes, although they vary in size and degree of darkness. Lesions are open-ended “holes” enclosed on three sides by trabeculae. The open-endedness of a lesion indicates that metabolic activities are still taking place although at a reduced rate. Lacunae are clustered lesions (two or more) closed at both ends. Crypts are small, closed single lesions, usually very dark. Both lacunae and crypts indicate encapsulated areas of toxic material in which metabolic function has apparently ceased. A white line around the outside of any crypt or lacunae indicates calcification of tissue surrounding the encapsulated area. Changes in the iris indicate gradual purification of the system, the elimination of morbid matter and poisons, and readjustment of the system to normal conditions under the regenerating influence of natural living and treatment. When a person has been treated successfully for a chronic ailment, delicate white intermeshed lines (fibrillar tissue) begin filling in the formerly dark grey area. If the course of therapy is effective, healing lines may be expected to begin appearing in about three weeks. Carina is available to lecture for your group or institution on this subject. Carina Harkin BHSc.Nat.BHSc.Hom.BHSc.Acu. is a practitioner of 11 years, complementary medicine lecturer of 4 years and mother of six in Galway, Ireland who practices what she teaches. All products are available through www.carahealth.ie. Remember, we are here for a good time not a long time, enjoy your food life!